An update to PopChar X, the Mac utility for inserting special characters into documents, promises to speed up that process. With the newly released version 5.0, PopChar X users will be able to store frequently used characters in a custom Favorites group. PopChar X 5.0 adds a favorites feature to the character insertion utility. Built by Ergonis Software, PopChar X helps users find and insert special characters into application. 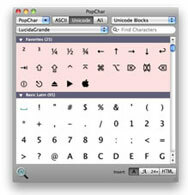 Instead of having to memorize complicated key sequences to invoke extended ASCII or Unicode characters, users just summon the PopChar X window from the Menu bar and click on the desired character to insert it. PopChar X 5.0 figures to make that process easier with its new Favorites feature, which groups frequently used characters. The favorites group always appears at the top of the utility’s characters table for fast access. Previously, users had to rely on the utility’s Recently Used feature to quickly insert frequently used characters. That’s not the only feature in version 5. Ergonis also added the ability for users to define a hotkey that opens and closes the PopChar window. The developer says the update contains under-the-hood improvements that speed up display and scrolling of the character table and improve dynamic updates of special cases for specific applications. Ergonis provides a full list of new features and bug fixes in PopChar X 5.0 on a Web page detailing the application’s version history. Pop Char X 5.0 costs €30 for a single-user license; anyone who bought the utility in the last two years can upgrade for free. In March, Ergonis changed its license and upgrade policy—a single-user license now lets you install the utility on two computers instead of limiting you to a single machine. (The €45 family pack covers five computers in the same household.) Ergonis has also moved away from time-based upgrades to version-based upgrades—going forward, minor updates to the software will be free, while major overhauls will require an upgrade fee. PopChar X users who bought the utility more than two years ago can upgrade for €15. Finds characters across multiple fonts. Offers multiple ways of finding characters in a font.